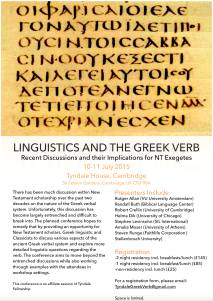 If you like Greek, you need to be there. Check it out! I hope I did not keep too many in suspense for too long. … and I hope you do not mind being kept in suspense a little bit longer. In November of 2012, at ETS in Milwaukee, I had dinner with Steve Runge, Randall Buth, Josh Westbury, and Brian Schultz. During our conversation, Randall mentioned the book The Prominence of Tense, Aspect and Mood by D.N.S. Bhat, a cross-linguistic, typological study of the interaction of tense, aspect, and mood in verbal systems. Randall told us that we had to read it and that it would inform our understanding of Greek. We did. It did. 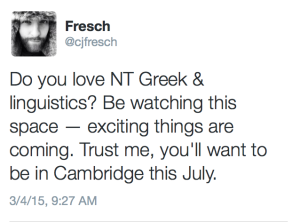 For me, this was the beginning of really thinking about the Greek verbal system linguistically.